A. I am Deena Prince, from Vasai, working as a Critical Care in a multi-speciality hospital. I have a 5-year-old little angel name Kenisha. Her name means a beautiful life, because after all she has made me become a mother, and life is truly beautiful with her. A. Cycling has been my childhood love, however, once I entered the professional line, academics, carrier overpowered my passion and somehow my cycle remained untouched for a few years. But after marriage whenIi pursued my Masters, my husband again gifted me a cycle -Maxis, which I started using as my mode of commute daily. And that’s where I found my profound love for cycling. A. Bicycle plays a very important role in my life, pedalling helps me be fit. I work in a cardiac department and I do need to run around for emergencies, so fitness helps me in my job too. Secondly, at home my daughter keeps me on my toes, so the more fit I’m, the more I can run around behind my daughter too. I usually begin my day with a ride or else end my day with a ride, those few hours when I cycle I feel like I have meditated. This helps me be myself and makes me stronger physically and mentally. A. My husband has always helped me and motivated me to train and cycle daily, especially after my delivery. Right after 2 months of delivery, my husband used to wake me up early and say, “Go, Deena , I’ll take care”. Training daily has helped me be more organised as I wake up early in the morning when every is sleeping, leave for my ride and return back when everyone is about to wake up. So this helps me live my passion and be with my family too. Q. 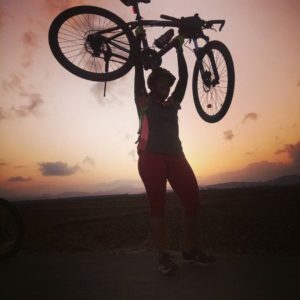 What excites you about the growth of women cycling India? A. It is not like before, women have started taking up cycling seriously, and moreover its moms and married women who are getting serious about it. Numbers are significantly increasing. But in a developing country like India, there are many societies where still women are looked down upon. For example, in my vicinity itself, many women want to take up cycling but lack of family support refrains them from getting into it. So its not just your passion, but its the entire family support that you need if you have to live your passion especially after being a mother. A. Fitness has been my core source to take up cycling and moreover, my daughter too gets motivated when she sees me leaving for cycling. She always says my helmet is my crown and indeed she makes me feel like a queen when she says that. A. The best part is whenever I gear up and come to the hall, it’s my daughter Kenisha who gets me my lights, gloves, helmet and all the accessories. She loves popping water out from the bottle too. When I come back from a ride, she will take out all my gears and wear it by herself and asks me to take her selfie. 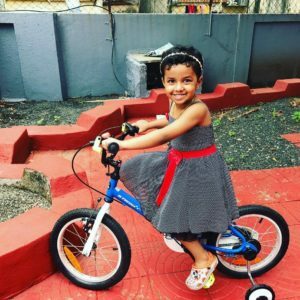 The hilarious part is when I am annoyed with her, she gets frustrated and tells me, “MUMMA U PLEASE GO FOR CYCLING” and then passes a smile. A. Cycling has been the ultimate source of fitness, however, if women cannot pedal or cycle or difficult to leave their home premises, simple physical activity like squats, jog, skipping, walking around, using stars can also be done. If you are cycling, doesn’t mean you need to ride really far away, its all about the limitations you have. I do often ride around my house in loops, which helps me be close to my house too. A. Very much it is important, for me the biggest disadvantage is I live in an independent house, so my daughter doesn’t have too many friends around to play, but whenever possible I send her to her grandmother’s place as she stays in a building and she loves playing there with her friends on the ground. I let her play as much as possible. 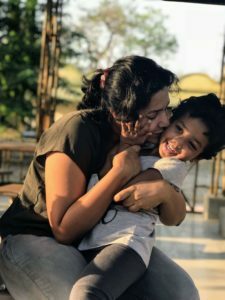 Kids now-days are getting addicted to mobiles and tablets, so these moments of play make them forget about these addictions and help them be physically fit too. A. Being a mother in itself is the best thing a woman can be. A proud mom who take initiative to keep fitness as her motivation will motivate her child too to get involved in sports and let their child explore best in themselves too. Read Namu Kini’s Interview here.